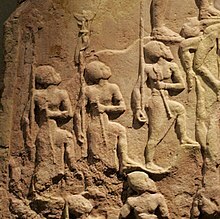 "Sargon, the king of Kish, triumphed in thirty-four battles (over the cities) up to the edge of the sea (and) destroyed their walls. 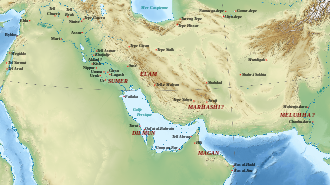 He made the ships from Meluhha, the ships from Magan (and) the ships from Dilmun tie up alongside the quay of Agade. 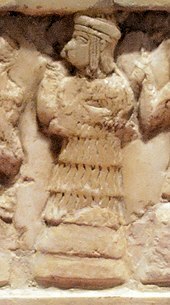 Sargon the king prostrated himself before (the god) Dagan (and) made supplication to him; (and) he (Dagan) gave him the upper land, namely Mari, Yarmuti, (and) Ebla, up to the Cedar Forest (and) up to the Silver Mountain"
International trade developped during the Akkadian period. 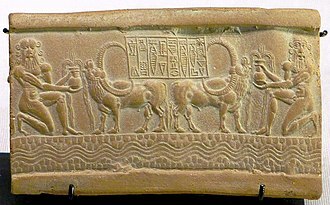 Indus-Mesopotamia relations also seem to have expanded: Sargon of Akkad (circa 2300 or 2250 BC), was the first Mesopotamian ruler to make an explicit reference to the region of Meluhha, which is generally understood as being the Baluchistan or the Indus area. 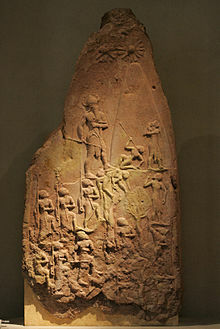 The Akkadians used visual arts as a vector of ideology. 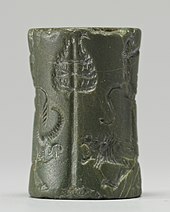 They developped a new style for cylinder seals, by reusing traditional animal decorations but organizing them around inscriptions, which often became central parts of the layout. 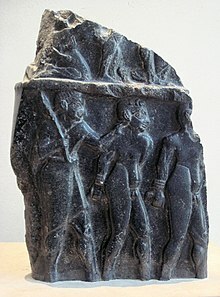 The figures also became more sculptural and naturalistic.New elements were also included, especially in relation to the rich Akkadian mythology. ^ a b c Schrakamp, Ingo (2013). 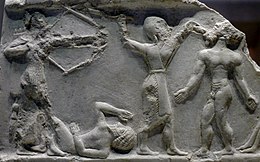 "Sargon of Akkad and his dynasty". In Bagnall, Roger S. The Encyclopedia of Ancient History. Chicago: Blackwell. pp. 6045–6047. doi:10.1002/9781444338386.wbeah24182. ISBN 9781444338386. ^ Buccellati, Giorgio; Kelly-Buccellati, Marilyn (2002). 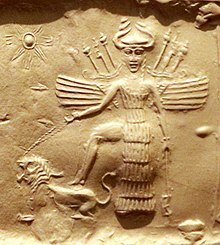 "Tar'am-Agade, Daughter of Naram-Sin, at Urkesh" (PDF). In Al-Gailani Werr, Lamia. Of Pots and Plans. Papers on the Archaeology and History of Mesopotamia and Syria presented to David Oates in Honour of his 75th Birthday. London: Nabu. pp. 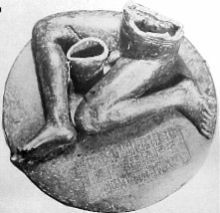 11–31. ISBN 978-1897750629. Retrieved 18 March 2015. Prince, John Dyneley (1911). 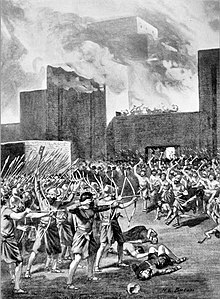 "Akkad" . In Chisholm, Hugh. Encyclopædia Britannica. 1 (11th ed.). Cambridge University Press. p. 457.